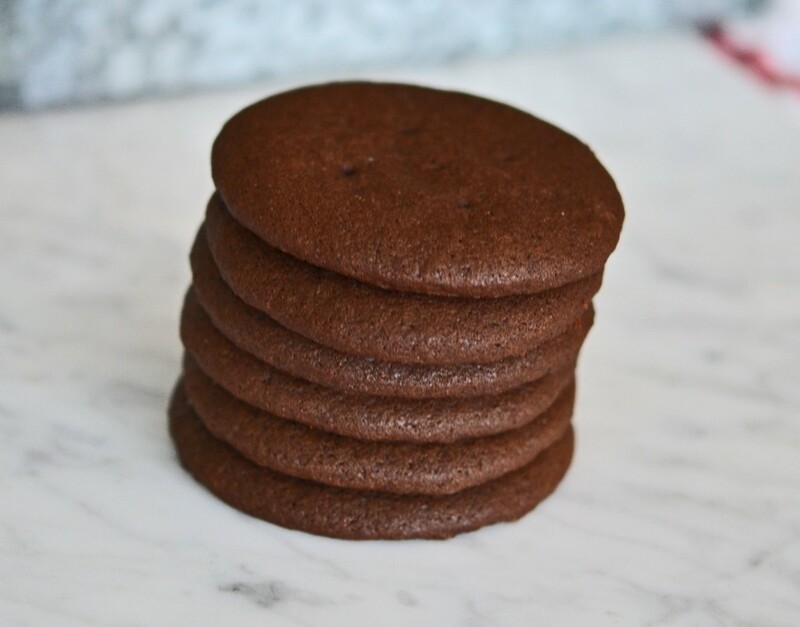 These thin and crispy gluten free chocolate wafer cookies are rich and chocolatey and perfect for making all sorts of no-bake warm weather treats, from icebox cakes to cookie crusts. Stock up for summer! Remember those Nabisco chocolate wafer cookies that come in those narrow packages? These crispy, crunchy chocolate cookies are just like those, but of course, they’re gluten free. And they are perfect for doing some very important things, especially in the summertime. When you see blunt edges on cutout cookies, that means that they really haven’t spread or risen much during baking. They have a way different texture than soft & chewy chocolate cookies, which are more cakey. Those give when you bite into them, which makes them perfect for an ice cream sandwich. These crunchy cookies make excellent cookie crumbs when crushed. Plus, they’re lovely for icebox cakes of all kinds. I know that you can’t really call something “no bake” when you had to bake cookies first to make it. But hear me out! I’ve searched high and low, and I simply can’t find any simple Nabisco-style gluten free chocolate wafer cookies for sale. You can find packaged GF graham crackers (even though mine are better), and even crispy chocolate chip cookies. But the simple, noble chocolate wafer must be baked. But they keep for weeks on the kitchen counter when stored in a sealed glass container, or for months in the freezer. Drop cookies are portioned with a spoon or ice cream scoop and dropped onto a baking sheet. They’re a great place to start out baking. 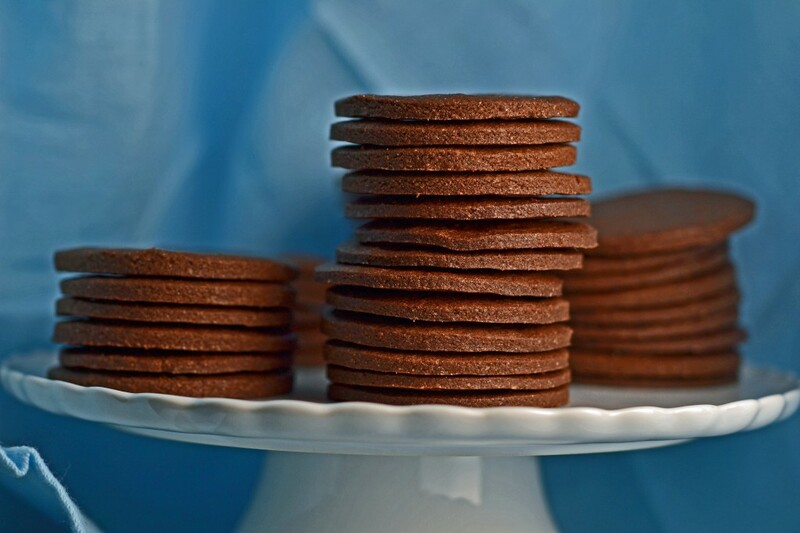 Cut-out cookies like these chocolate wafer cookies are formed by rolling out the dough with a rolling pin and then using a cookie cutter or knife to cut out shapes for baking. I know that some of you consider that process a “page turner” in a cookbook. You see that the dough has to be rolled out, and you’re on to the next page. But rolling out cookie dough before cutting it into shapes has so many benefits! And I promise it’s super easy, especially if you know my tips and tricks. Tip #1. Feel the dough with your hands. Rolling the dough into an even layer tends to be the most intimidating part. The secret is in how it feels, much more than how it looks. Your eyes can’t really compare the thickness of the cookie dough from one spot to another. But your hands passed over the top of the dough will know in an instant if one spot is too thick, another too thin. Tip #2. Use the right paper. If the instructions in a recipe tell you to roll out the dough between two pieces of unbleached parchment paper (like they do in this recipe! ), definitely do it! Bleached parchment paper is thick and stiff, so it’s not very flexible. Plastic wrap is guaranteed to wrinkle, which will leave a million little wrinkles in your rolled-out dough. Unbleached parchment paper, the brown kind, is absolutely perfect for this task! Tip #3. Use a light touch. If you find that you’re rolling lots of creases and wrinkles into the dough, apply less pressure with the rolling pin and pass over those spots again. It’s rolling pin. Not a pressing pin. Tip #4. Chill it. If the dough seems to difficult to cut cleanly, place it, still in the parchment paper, on a cutting board and chill it in the refrigerator or freezer for a few minutes. It’ll firm up enough to cut. Tip #5. Peel away. After cutting out your shapes, peel the surrounding dough away from the shapes, and then peel the paper away from under each cut-out shape. It keeps the cut-out from stretching or breaking during the transfer. I plan to no-bake with these cookies all summer long, and I’d hate for you to be left out! Watch the how-to video, read the tips, and then get your ingredients ready. Dairy-free: Good news! I’ve successfully made these cookies dairy free, and they were absolutely just as good in taste and texture as the original recipe. My favorite substitute for unsalted butter is Melt brand VeganButter. Be sure it’s at room temperature before you use it in the recipe. If you can’t find Melt brand, I’d try using half nonhydrogenated vegetable shortening (I really like Spectrum brand) and half Earth Balance buttery sticks. If you use all Earth Balance, the cookies will not hold their shape, as Earth Balance has a ton of moisture. And all shortening will probably make for cookies that are too dry. Egg-free: There’s only one egg in this recipe, so it’s a pretty good candidate for making it with a “chia egg,” which is just 1 tablespoon of ground white chia seeds mixed with 1 tablespoon lukewarm water and allowed to gel. I haven’t tried it, though, so you’ll have to experiment! 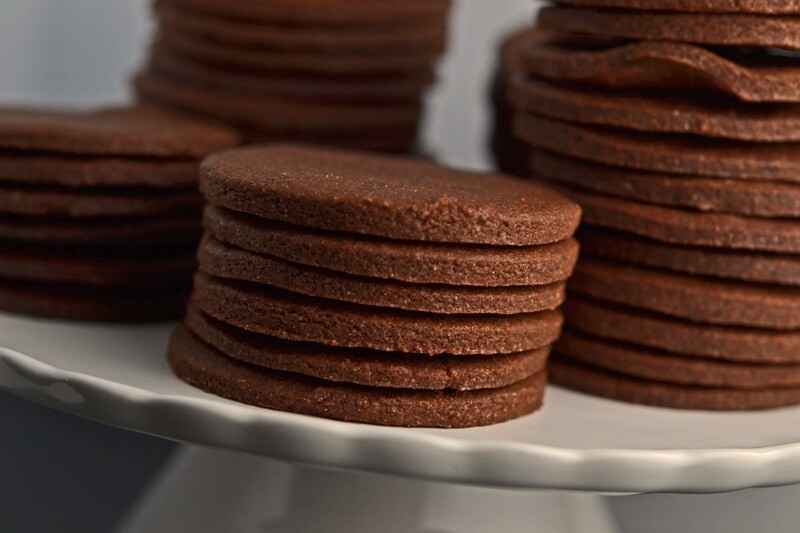 Cocoa powder: Since these are chocolate wafer cookies, you can’t make them without cocoa powder. But if you don’t have Dutch-processed cocoa powder, you can use natural cocoa powder. Just add 1/8 teaspoon baking soda to the dry ingredients and whisk it in. Sugar: I haven’t tried this recipe with a granulated sugar substitute, but I recommend either Swerve brand granulated sweetener or Lankato monkfruit granulated sweetener. You will likely have to add a bit more water by the half teaspoonful to get the dough to come together, as those sweeteners tend to be drying. In a large bowl, place the flour, xanthan gum, cocoa powder, sugar and salt, and whisk to combine well. Add the butter, egg and vanilla, and mix until the ingredients are mostly combined. With clean hands, knead the dough until smooth. If necessary to bring all of the dough together, add 1 teaspoonful of lukewarm water and knead it in. Divide the dough into two equal parts, and roll each out between two sheets of unbleached parchment paper until the dough is 1/8 inch thick (the thickness of a nickel), no thinner. Pull back the top sheet of parchment paper on one piece of dough. With a round 2 1/4-inch cookie cutter, cut out rounds as close to one another as possible. Remove the surrounding dough, and set it aside. Transfer the rounds to the prepared baking sheets, and place them about 1/2-inch apart (they will not spread during baking). Gather the scraps, roll them out again, and cut more rounds. Repeat with the second piece of dough. Place the baking sheets, one at a time, in the center of the preheated oven and bake, rotating once during baking, for 8 minutes or until the cookies spring back when pressed lightly in the center. Remove the baking sheet from the oven, and allow to cool on the baking sheet until firm. Transfer to a wire rack to cool completely. Originally published on the blog in 2012. Video and most photos new, recipe unchanged. That’s great to know that the cookies turned out well with your sugar substitute, Linda! I’m afraid you can’t use coconut flour in any recipe that wasn’t designed for it. This recipe simply won’t work with coconut flour. It’s very unique. Sorry! This has made my day!! My favourite recipe when I was a child was a “chocolate log”. Basically the nabiaco cookies glued together horizontally with whipped cream, then covered with even more whipped cream and refrigerated until the cookies become soft. I can have it again!! Thank you!! You sure can have it again, Rebekah!! Thank you very much. I used to make this for my family years ago and assumed I would just never have this again since there aren’t any gluten free cookies and yet you created it. That’s exactly why I like to write about recipes like this, Patti! It’s not that you don’t already know how to make it, but you thought you couldn’t anymore. Now you know you can!! This is a very simple recipe, without too many ingredients, so each one matters a whole lot. It sounds like it might be your flour. And be sure to measure your dry ingredients by weight, not by volume. You don’t want to use a handheld mixer for this, since the dough should be relatively thick and will come together as you knead it. Have you ever tried a non dairy sub for the butter in this recipe? I haven’t, Jenny. But I’d try vegetable shortening, not margarine! I LOVE YOU!!!!!!!!!!!!!!!!!!!!!!!!!! !you have made all my dreams of yummy foods come true. I am very proud of myself for going without egg rolls and crab puffs and now I don’t have to anymore. I have autism and many times I feel so punished because I cant go out and eat at restaurants (hey plus side I lost 40 pounds). I can’t wait to get your book. I see you use parchment paper for baking these cookies, but on some of your recipes (GF Milano) you do not. How do you know when to use parchment, especially on the wavy USA pans? Will they still turn out OK if you never use parchment? Is a silpat mat an OK replacement for parchment paper? Good question. I use unbleached parchment paper on my USA Pan baking sheets when I want to protect whatever I’m baking from the USA Pan lines you referred to. It doesn’t affect the baking in any way, especially when you use unbleached parchment paper since it is so thin. A silpat would work, too, for sure. And I also mention parchment paper because I assume that most people are not, in fact, using USA Pans which are the only truly nonstick pans I have ever used. If you are not using a truly nonstick pan, it is important to line it somehow. So I made these yesterday. You’ve made my summer. :) What else is there to say? The possibilities are flipping endless, but then today I see vanilla? Holy Hannah! Chocolate Cookie Crumb Crust under my Banana Cream Pie Filling, HERE WE COME! AWESOME!!! These look so good! I have your cookbook and I’m ready to party! Any hints that one can drool by? Smarty pants! My Dutch cocoa is here so I am ready sista. Ooooo! Please oh please say you’re making icebox cake!!! I’ll never tell, Alli. Okay, I’ll tell tomorrow. :) But there will be plenty more recipes to come using these babies!